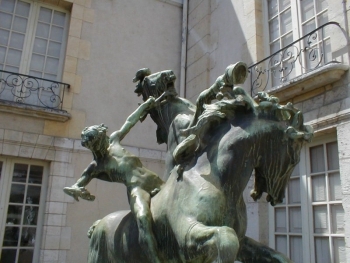 This group feturing a man taming horses can be seen in Vernon’s A. G. Poulain Museum, in the center of the town neighbouring Giverny. The sculpture is due to Frederick MacMonnies, an American artist who lived and taught for several years in Giverny at the turn of the 20th century. The man is on a smaller scale than the horses to make them look wilder, and to show the superiority of the spirit over the animal.